Clothes dryers are an appliance that needs to be maintained and have their vents cleaned. Keeping your dryer vent clean is so important for the safety of your home. The professionals at Superior Cleaning provide dryer vent cleaning. This is another important service in the maintenance of a safe and healthy living environment. Leaving too much debris in your dryer vent increases the risk of a fire in your home, so it is important to keep your vent clear! 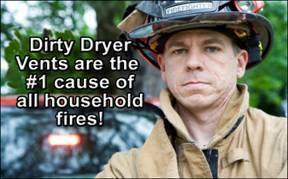 Don't take the risk of a dryer fire - give us a call today!